Harley and I took another whirlwind trip to Savannah this weekend to Inn-sit for a friend of ours who owns a Bed & Breakfast there. She had to go out of town and needed someone to run it for two days and boy was that fun! As we were riding around during our off time, we were quite suddenly and ever so sweetly greeted by a healthy, heaping helping of a bike lane located on Price Street. It’s a one-way street with parking on the very right, one car lane on the left, and one big fat bike lane right smack in the middle and just about as wide as the car lane. This facility truly was designed with cyclists in mind. It’s a bike lane right next to parking, with one rarely implemented element included in its design – it’s wide enough to help us avoid the door zone. I must remember to write a blog about our trip to Keystone and Melrose right here in Florida. Melrose is located in self-proclaimed “Bike Friendly Putnam County”. That it was, folks. Not a lot of infrastructure to speak of there, however, the cars gave us three feet and didn’t honk at us. 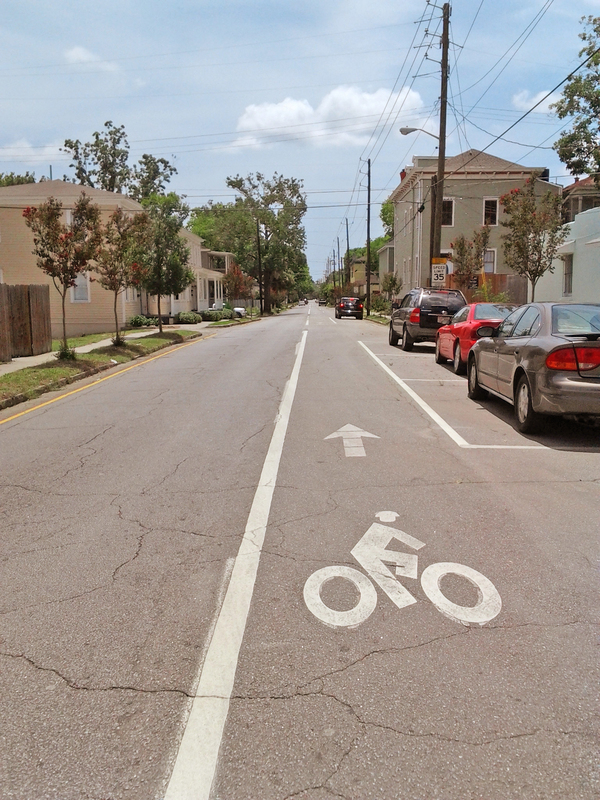 If I get no more infrastructure out of my advocacy efforts here in Jax, the very least to make my heart happy would be more respectful drivers to come from these efforts. All the sharrow and bike lane paint in the world isn’t going to save my rear end from enraged, distracted, speeding motorists. Next stop: Gloucester and Boston, Massachusetts, and Bar Harbor, Maine! More Bike Friendly City stories to come, folks. Till then, ride safe and drive safe. As I continue to gather experiences from other cities, I can better implement good working ideas for the streets of Jacksonville. No need to reinvent the wheel here, folks. We can use other preexisting models to help us get on track far faster than if we were to continue to struggle with the prospects of figuring everything out on our own. Let’s show our city planners that if other cities can do it, then we can do it too! We deserve it! ← Kudos to the Rethreaded Team and e2Ride Bike Tours! It looks hand painted to be honest, and they certainly made an effort to give EVERYONE what they needed, good job at considering ALL THEE People. RIDE BIKES? !